"Sanus per aquam." - Latin: health through water. "Thousands have lived without love, not one without water." - W.H. Auden. BOTTLED WATER is drinking water (e.g., well water, distilled water, or spring water) packaged in plastic or glass water bottles. Bottled water may be carbonated ("fizzy") or not. Sizes range from small single serving bottles to large carboys for water coolers. MINERAL WATER is water from a mineral spring containing various minerals such as salts and sulfur compounds. Mineral water can be sparkling (with effervescence), or still (without effervescence). In modern times, it is far more common for mineral waters to be bottled at the source for distributed consumption. Travelling to the mineral water site for direct access to the water is now uncommon, and in many cases not possible (because of exclusive commercial ownership rights). There are more than 3,000 brands of mineral water commercially available worldwide. The more calcium plus magnesium ions are dissolved in water, the harder it is said to be; water with few dissolved calcium plus magnesium ions is described as being soft. 10 Amazing Health Benefits of Drinking Zamzam Water - Gyanunlimited. 10 Best Mineral Water Brands - 10BestWater.com. 10 most expensive bottles of water EVER! - GiveMeTap. 12 Most Expensive Water Brands In The World - "Kona Nigari vs Acqua di Cristallo." £41,335 for a bottle of water: the world's most expensive food & drink revealed - The Telegraph. A new app can help you stop buying bottled water - "Tap launched an app Tuesday that displays nearby clean drinking water locations, from restaurants and retail stores to public water fountains, so you can refill your water bottle. It's like Google Maps for clean drinking water." Ball - since 1880. "The leading global supplier of innovative, sustainable metal packaging for beverage and aerosol products, as well as aerospace and other technologies and services." BOTTLED WATER FROM AROUND THE WORLD - comprehensive global resource: water ratings including mineral water, sparkling water, spring water, artesian water, well water and other water sources. BOTTLED WATER OF THE WORLD - map of bottled waters. Bottled Water or Tap: How Much Does Your Choice Matter? - The New York Times. BOTTLED WATER WEB - since 1995. "The Definitive Bottled Water Site." Our mission is to provide the most accurate information about the bottled water industry. Can You Drink Too Much Water? - The New York Times. Drink Up! Most of Us Could Benefit From More Water - The New York Times. Dubai's best bottled water - TimeOut Dubai. 'Fiji Water girl' suing company following Golden Globes hostess gig - "Fiji Water says lawsuit by model Kelleth Cuthbert, whose images on the red carpet went viral, is ‘frivolous’ and ‘without merit’." Guy Ritchie cancels Madonna's order to fill swimming pool with Kabbalah water - The Telegraph. Highland Spring - Scottish supplier of bottled water. It produces still and sparkling water at its factory in Blackford, Perth and Kinross, although despite the name this area is not actually within the Scottish Highlands. Highland Spring was the highest-selling sparkling water in the UK. How New York Gets Its Water - called the champagne of drinking water. How to Make a Millennial Feel Cozy in Just One Beverage - "CBD? Check. Bubbles? Check. Ironic fonts? Check. The aggressive marketing of commodified wellness? Oh yes." How to Meet Your Body’s Water Needs - The New York Times. 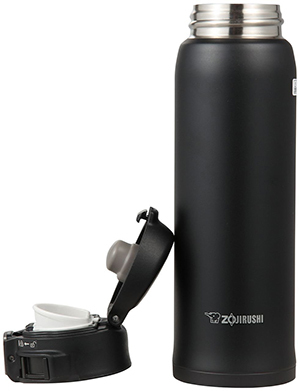 Hydro Flask - "A little more hydration lets you have a little more fun. From mountain trailheads to morning yoga practice, our 24 oz Standard Mouth bottle is just the right size for staying hydrated before, during, and after activity. Our largest Standard Mouth available uses TempShield double wall vacuum insulation to keep your water refreshingly ice cold for up to 24 hours." Is alkaline water a miracle cure - or BS? The science is in - "Beyonce and Tom Brady swear by it – but experts throw cold water on the new beverage fad." Is Hydrogen Water Actually Good For You? - TIME Magazine. Is sparkling water as hydrating as regular water? - CNN Health. KABBALAH WATER - supposedly "dynamic, living, fractal and crystalline" whatever all that means. It claims a connection with the Jewish Kabbalah which others deny. Basically it appears this group, considered a cult, buys Canadian mineral water relatively cheaply, and adds a little quantum woo. Madonna supposedly paid close to $10,000 to get this spiritually radiant water into the central heating system of her mansion. Liquid assets: how the business of bottled water went mad - "How did a substance that falls from the air, springs from the earth and comes out of your tap become a hyperactive multibillion-dollar business?" List of bottled water brands - Wikipedia. Mineral water pods (not water bottles) now exist - The Verge. Packaged water to become soft drinks leader in 2015 - canadean. Proof: whisky tastes better with water - The Telegraph. Raw water: the unsterilised health craze that could give you diarrhoea - The Guardian. Soma Bottle - "Glass Water Bottle." 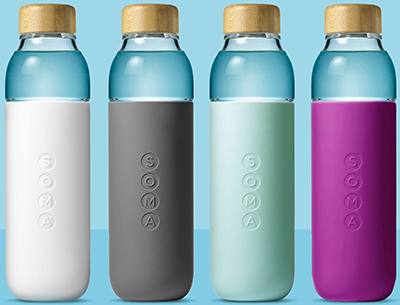 The Soma Bottle is the healthy way to stay hydrated everywhere. Made from high quality, shatter-resistant glass, with an easy grip protective sleeve, it’s perfectly designed to fit into your bag, your cup holder, and your life. Selling Bottled Water That’s Better for the Planet - The New York Times. 'Take a 'recess' from stress!' 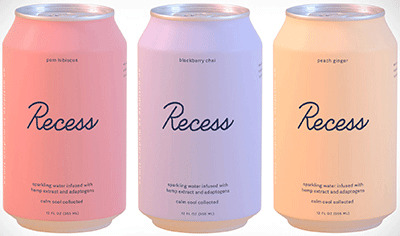 says new sparkling CBD water brand - "By using a blend of CBD and adaptogenic herbs in its sparkling water recipe, Recess hopes to carve out a spot in the growing crowd of CBD-infused beverages that it predicts will be ‘bigger than energy drinks’ in the next 10 years." The Water in Your Glass Might Be Older Than the Sun - The New York Times. Top 12 Most Expensive Water Brands In The World - Financesonline.com. Turning water into wine: how did simple H2O become a luxury commodity? - "From crystal infusions to water sommeliers and even bottling the frequency of rainbows, the top end of town has well and truly cashed in on the world’s most vital resource." VICHY WATER - a naturally effervescent mineral water from the springs at Vichy. Water Bottle Germs Revealed - Treadmill Reviews. ‘Wellness water’ is very popular - but is it better than what comes out of the tap? - "Bottled water brands have long touted added ingredients in the name of health. It’s debatable whether they’re worth the extra cost." What is Hydrogen Water and Should We be Drinking it? - HuffPost. Why We All Need to Drink More During Hot Weather Exercise - "Some athletes have begun to eschew fluids during hot weather workouts, in hopes that the privation might somehow make them stronger. A new study suggests it doesn’t." Why You Should Probably Drink Filtered Water - The New York Times. 10 THOUSAND BC - "Luxury Glacier Water." 138 WATER - "Electrolyte Enhanced Purified Water!" Premium, purified drinking water that is processed using reverse osmosis, carbon and micro filtration and is UV and ozone treated with electrolytes added to ensure a crisp, clear taste. Acqua di Cristallo Tributo a Modigliani - world's most expensive bottled water: $60,000 for a 1.25 ml bottle. ACQUA DI NEPI - Acqua di Nepi is among the very few naturally carbonated waters in the world. Microbiologically pure natural mineral spring water from Apennine Mountains (Lazio), Italy. ACQUA MINERALE GERACI - sparkling mineral water. Acqua Panna - "Acqua Panna still mineral water encompasses the culture, heritage and refined elegance of the land from which it flows: Tuscany. A history of good taste since 1564." ADELHOLZENER - "Adelholzener mineral water stands out because of its particular purity. This is because of its unique origin: The Bavarian Alps in Southern Germany. As it permeates through the alpine rock the mineral water is not only purified but also enriched with valuable minerals." APOLLINARIS - since 1852. "The Queen of table waters." German naturally sparkling mineral water, owned by Coca-Cola. AQUA MAESTRO - "The Source for Fine Waters." Choose 35 brands of the world's finest bottled mineral waters, both still and sparkling, available in sizes from 7.7 ounce to 2 liter containers. AQUADECO - since 2004. Natural Canadian spring water. Aquafina - since 1994. "For Happy Bodies. Pure Water. Perfect Taste." Purified bottled water products produced by PepsiCo, consisting of both unflavored and flavored water. Badoit - since 1778. "Rebirth of an icon." 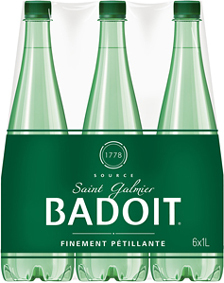 Badoit was recognised in 1778 by King Louis XVI’s physician as having virtues that "enhance the appetite, soothe digestion and lift the spirit". The water is naturally carbonated: Magnesium (80mg/L), calcium (153mg/L), fluoride and, above all, valuable bicarbonates (1,250mg/L). 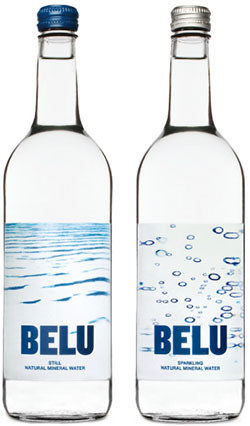 Belu Water - since 2004. "ALL PROFITS TO WATERAID. In addition to our ethical British bottled mineral water, we have the Belu Filter Initiative, for hotels, restaurants and catering outlets." Carbon-neutral & ethically-sourced bottled waters. Berg - since 2014. "Swiss Mineral Water." One of the best natural mineral waters from the swiss alps, rich in essential minerals. 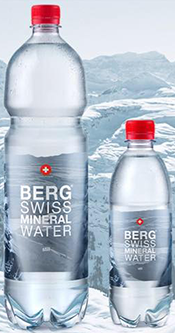 Berg Water - since 2005. "Iceberg Water From Canada." A unique soft water with a super low mineral content. This water's journey started over 15,000 years ago in the ancient glaciers of western Greenland. Beverly Hills 90H20 - since 2013. 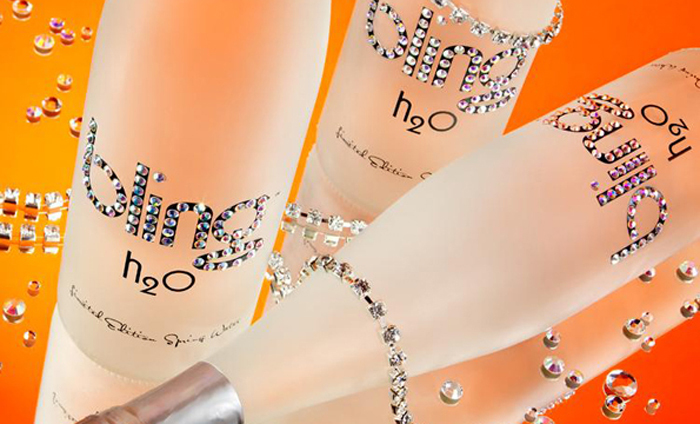 "The Beverly Hills Lifestyle in a Bottle." 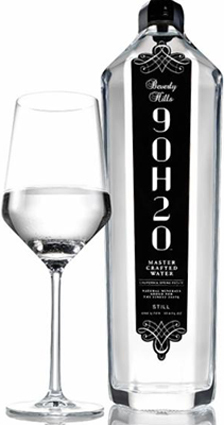 Winner of the World’s Best Water Award, the extraordinary Beverly Hills 9OH2O was designed from the ground up by a world-class team of experts, including the world’s leading water sommelier Martin Riese, to be the ultimate in water. BOTTLED WATER OF THE WORLD - comprehensive worldwide bottled water rersource: water ratings including mineral water, sparkling water and artesian water, taste analysis, reports on health and more. Calistoga Sparkling Mineral Water - comes from a source deep in the earth, below the small town of Calistoga in California's Upper Napa Valley. Canadian Springs - since 1882. Offers customer’s quality bottled water. Cape KAROO - since 2005. "Natural Mineral Water." Award-winning South African water. As anyone with a discerning palate will confirm, natural spring water is not tasteless. The outstanding taste of the Cape Karoo product comes from the dissolved minerals it absorbs gradually and naturally during its leisurely journey through the granite of the Paardeberg mountains. CAVAGRANDE - since 1950. Natural mineral water. CHATELDON - since 1650. Known for its naturally carbonated mineral water. It was the first mineral water exploited in France and transported by bottles to the Court of Louis XIV in Versailles. This water is used for its diuretic and digestive properties. It is also rich in potassium, sodium and fluorine. Contrex Natural Mineral Water - since 1861. "Capitale de la saveur minceur." Born at the heart of the Vosges, protected by impermeable layers of clay and marl, Contrexéville water has the remarkable characteristic of containing calciferous and magnesian sulphated elements. Crystal Geyser - since 1977. "Sparkling Mineral Waters." 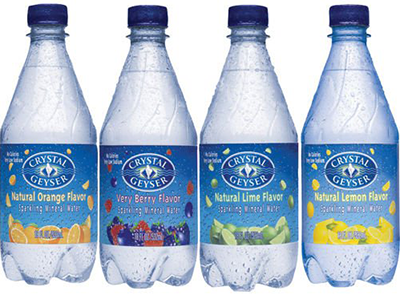 Why is Crystal Geyser Sparkling Water the best sparkling water in the world? Our founders spent more than a year painstakingly studying geological survey maps, exploring water sources, and performing countless taste tests before finding what they believe is the perfect water. DEESIDE MINERAL WATER - since 1760. "One of the purest bottled waters in the world. It flows from an ancient spring in Royal Deeside, Scotland." Our water is fundamentally different to most others because of specific characteristics in its natural chemistry - low mineral content, low pH value and low redox. DONAT MG MINERAL WATER - since 1908. "More than magnesium. Natural mineral water with over 400 years of tradition that alleviates the problems of modern life." It helps with constipation problems, heartburn and magnesium deficiency problems. Élan - "Natural Mineral Water." élan is naturally balanced and low in sodium. A premium pure & quintessential natural mineral water, which is perfect for an everyday setting, available in a range of sizes whether you are on the go, at work, in the gym or at home. ELSENHAM - artesian spring water is rich in minerals particularly calcium, iron, low in sodium and rich in strontium. EVIAN - since 1859. "Live young." Mineral water coming from several sources near Évian-les-Bains, on the south shore of Lake Geneva. 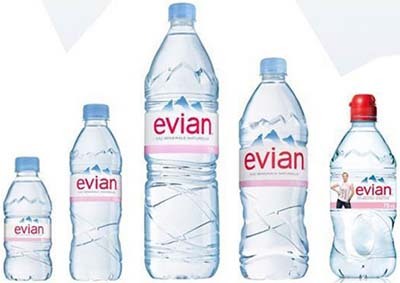 In popular culture, Evian is portrayed as a luxury and expensive bottled water. Ferrarelle - "Ferrarelle enhances your vitality and wellbeing because it is 100% naturally effervescent, perfectly balanced, and has a unique, delicious flavor. Ferrarelle is the result of a long journey within the uncontaminated depths of the earth: Nature's gift to mankind that was first bottled in 1893." 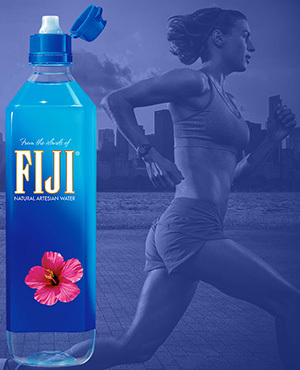 FIJI WATER - since 1996. "Untouched by Man." Natural artesian water. The water comes from an artesian aquifer in Viti Levu. Perfect for fitness, travel, an more. FILLICO BEVERLY HILLS - since 2005. 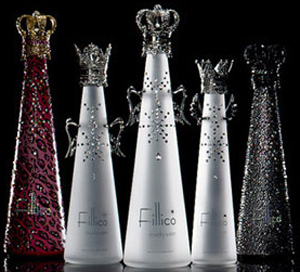 FILLICO JEWELRY WATER - official website. FINÉ - since 1998. Natural artesian water. FIUGGI - the Acqua di Fiuggi ("Fiuggi's Water") source runs through ancient volcanic deposits in the Ernici mountains which has an ecosystem that has historically been unaltered by humans. Fiuggi water is accredited by the Italian National Health Institute for kidney stimulation and helping to break down and dissolve kidney stones. Various medical studies have been performed and published in Italian scientific journals citing evidence that Fiuggi is beneficial for dissolving kidney stones and improving kidney function. Font d'Or - "We give shape to 'the best water in the world'." Five hundred million years ago, in pre-historic times, the mountains we now call the Guilleries Massif were formed. Deep in the heart of this massif, forged from granite, volcanic rock, slate and clay, the largest aquifer in the entire Iberian Peninsula was born. "The Cradle of Water." The Font d'Or spring, an ancient source of delicious, pure and health-giving water: "The best water in the world." Gerolsteiner - since 1888. "Both of our mineral waters come from the Volcanic Eifel region. Gerolsteiner Sparkling and Gerolsteiner Naturell differ in the carbonic acid content and in the mineralization, offering a water for every taste." 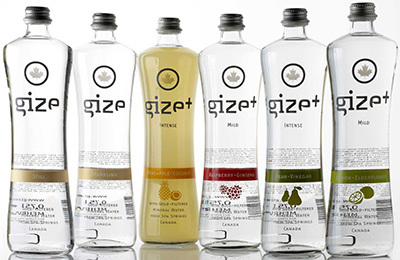 GIZE - since 2010. "Gold filtered mineral water." The gold-filtered mineral water from Canada, is the epitome of luxury and pleasure in their purest form. GLACE Rare Iceberg water - since 2009. "Discover the treasure hidden for 10,000 years. The purest natural water on earth." GLACÉAU SMARTWATER - since 1996. "Purity you can taste." Made from British spring water which is vapour-distilled before electrolytes are added. It has a distinctive, crisp, clean taste and is produced and bottled in Morpeth, Northumberland. Highland Spring Water - since 1979. "Scotland is renowned throughout the world for its pure, fresh water, and the careful protection of our land allows us to bring you the purest Scottish still and sparkling spring water we possibly can." HILDON WATER - since 1989. "Delightfully Still & Gently Sparkling. An English Natural Mineral Water of Exceptional Taste - Delightfully Still and Gently Sparkling." Comes from beneath the chalk hills of the beautiful Hampshire countryside in the South of England. Naturally low in sodium. Hydr8 - it is naturally sourced British water from sustainably managed rural catchment areas. IndigoH2O - "Premium Bottled Alkaline Mineral Water." IndigoH2O gets it’s beneficial alkalinity from calcium, magnesium, and potassium which appear naturally as mineral hydrates in the water making them easily absorbed by your body. Mineral deficiency is a factor in many health problems such as heart trouble, high blood pressure, bone loss, and even weight gain. By drinking IndigoH2O, you can help your body get more calcium and magnesium. If a mineral deficient body gets the minerals it needs, it can heal itself of many health problems. ISBRE - since 2000. "Norwegian Glacier Water - The World's Best Drinking Water." At Isbre, we've searched far and wide to find the world's purest water. We found it at a sub-Arctic glacier in a remote, exceptionally pristine region of Norway. Since Isbre means "glacier" in Norwegian, that's what we decided to call our product, because that's all you get: crisp, refreshing water with no impurities to disturb its taste. ISKILDE - since 2005. "Nordic Artesian mineral water." From Scandinavian Royal Houses to the Four Seasons George V in Paris to Noma, the #1 restaurant in the world, ISKILDE is a welcome companion to a stellar gastronomic experience. More than just water, but a symphony of taste, story and design. Isklar - since 2005. Brand of still & sparkling natural mineral water from the Folgefonna Glacier of Norway. 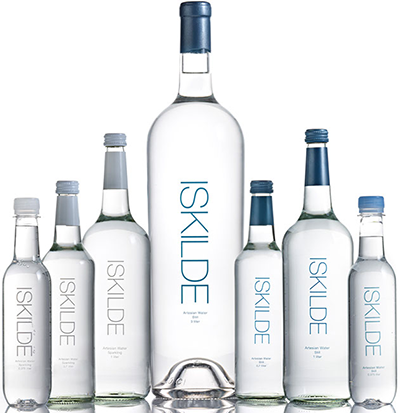 Isklar water comes in a bottle which features a distinctive pattern, inspired by the glacier from which the water derives. KONA deep water - "Deep Hydration from the Sea." Introducing Kona Deep, a pure and refreshing water from the deep ocean waters of Hawaii. Kona Deep offers a very different hydration experience because of its unique blend of naturally occurring deep ocean electrolytes. LAUQUEN - since 1996. Discontinued. LES EAUX MINÉRALES D'OULMÈS - since 1933. LLANLLYR - "Llanllyr SOURCE water has been drawn from natural springs in Wales for more than 800 years. For the last 300 years, the fields of Llanllyr have been organically farmed. The result is one of the finest and most perfectly balanced spring waters in the world." LURISIA MINERAL WATERS - "Bolle and Stille Winner. Water is style." Stille is our natural flat water. Bolle is our version of water with added carbon dioxide of a natural source. Mill & Well - since 2010. "More than just water." Water is not just water, and good taste is not a coincidence. We bottle our spring water directly at the surface of the spring, and the water is only moving 10 meters from source to bottle. Nakd - since 2013. "Pure Artesian Water." Nakd offers one of the softest artesian waters in the world, rich in minerals like silica which are revitalising for the skin, a balanced alkalinity, which provides a neutral or “sweet” taste and low levels of nitrates which make it one of the purest and cleanest waters in the world. NESTLÉ BOTTLED WATERS - "Bottled water, a sealed container." Guarding and guaranteeing quality. The idea of bottling water is very old, but large scale bottling and transport began in the 19th century when spa became popular resorts. With bottling, you could in a sense take you cure home or nip down to the local pharmacy to purchase a favorite bottle of mineral water. 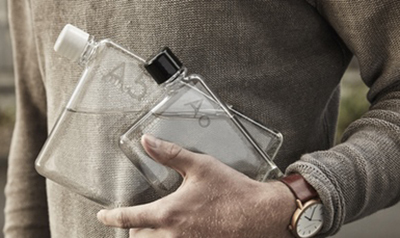 The bottle is the last link in a closed, hermetically sealed chain that preserves water from any external influence from source to consumption. Nestlé Waters is today World leader with a 11.3% market share. The general consumption of bottled is globally increasing in parallel with the growing demand for healthy and safe beverage. OASIS WATER - "Because water changes everything ... Since 1910, Oasis has focused on one thing and one thing only: delivering refreshing water to the world." OGO oxygen water - since 2005. The ideal drink for those wanting to combine the advantages of oxygen and pure, natural water. Ô MUSE - since 1715. "Grand Cru de l'Eau." Based on a rich past and a tradition rooted in the Bordeaux and Champagne soil, the Ô Muse Spirit has been transmitted from generation to generation, establishing a real connection between wine, spirits and water. Still & sparkling spring water. PERRIER - since 1863. Bottled sparkling mineral water made from a spring in Vergèze in the Gard département of France. Perrier is best known for its naturally occurring carbonation, distinctive green bottle, and higher levels of carbonation than its peers. Poland Spring - "100% Natural Spring Water." Founded in 1845 by Hiram Ricker. Poland Spring water is derived from multiple sources in the state of Maine, U.S.A.
RAMLÖSA - since 1707. Brand of carbonated mineral water from a source in Ramlösa Brunnspark in the southern part of Helsingborg, Sweden. Promoted in the U.S. via product placement in the television drama series The Sopranos. Recess - "We canned a feeling." Not tired, not wired. Recess is a sparkling water infused with hemp extract and adaptogens for balance and clarity. Packaged in pastel-colored cans and available in Blackberry Chai, Peach Ginger, and Pomegranate Hibiscus. 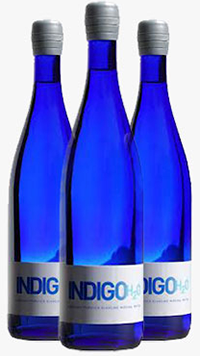 ROCCHETTA BRIO BLU - "Brio Blu is a natural lightly mineralised water, characterised by a delicate carbonation that makes it pleasing to the palate, while maintaining all the lightness of Rocchetta Water." The number one selling carbonated water in Italy. Rosbacher - German spring water. Mineral water with the unique 2:1 ratio of calcium and magnesium. SAN PELLEGRINO - since 1899. Sparkling spring water. Mineral water with carbonation added, produced and bottled at San Pellegrino Terme. Has been produced for over 600 years. SANFAUSTINO - since 1894, Sanfaustino is effervescent mineral water sourced from a spring in Villa San Faustino, Province of Perugia, Umbria, Italy. SILVER SPRING - since 1870. SMARTWATER - made from British spring water which is vapour-distilled before electrolytes are added. It has a distinctive, crisp, clean taste and is produced and bottled in Morpeth, Northumberland. SOHAT - Lebanese brand of mineral water that is the leading brand of bottled water in Lebanon, with a 35% market share. The water is light and crisp with low mineral content and almost no sodium. The brand was acquired by Nestlé Waters. 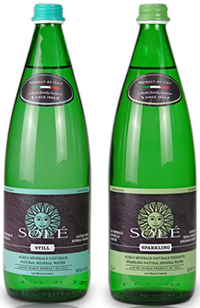 SOLÉ - "Premium Italian Natural Mineral Water." Sole water flows from the same pure and pristine Alpine source today as it has been for centuries. Soma Water - since 2012. "At Soma, we're designing beautiful, sustainable products to hydrate the world. 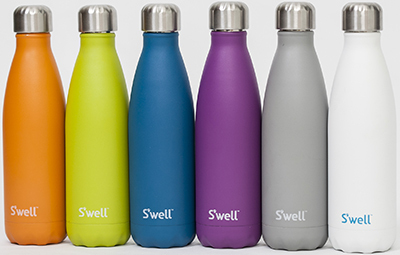 Every product purchase supports charitable water projects." SPA - "Natural since 1583." Brand of mineral water from Spa, Belgium owned by the Spadel Group. 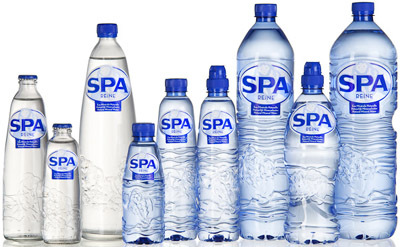 Spa mineral water has been bottled since the end of the 16th century and is very common in Western Europe and especially in the Benelux countries and Germany but is also exported to other parts of the world. Speyside Glenlivet water - sourced from the highest naturally occuring spring in the UK on the remote Scottish Crown Estate of Glenlivet - no less than 1,000 feet above sea level. The spring produces water with an unusually low mineral content. STAATL. FACHINGEN - "The water. Since 1742." The German premium brand from the famous spring Staatl. Fachingen. With its naturally high level of hydrogen carbonate of 1.846 mg/l and a unique composition of minerals. With a modest or mild sparkling taste Staatl. 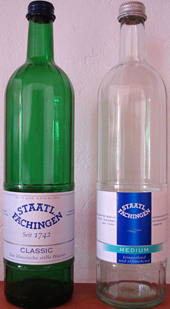 Fachingen is consumed by people who take care of the acid-base-balance. Best premise for a light hearted way of life. Among aficionados considered world's best mineral water. Favored by - among many, many others - Johann Wolfgang von Goethe and Adolf Hitler. SUPER NARIWA - "The Emperor's Water." The Chemical Buster That Breaks Down Chemicals, Encourages Proper Cell Hydration, Nourishment And Cleansing. Washes away toxins and waste products. Maintains a healthy pH - Supports your health by keeping your body fluids from becoming overly acidic. Increases hydration and detoxification in your body. Increases the stability of your cells. Rejuvenates. Svalbardi Iceberg Water - since 2015. "Luxury Water from Svalbard. Best Bottled Water of the Arctic." 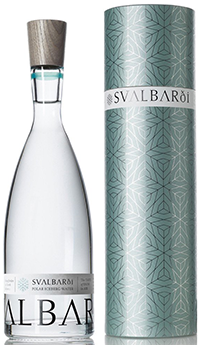 Svalbarði is the world's most exclusive bottled water. Pure polar iceberg water and unique materials create an award-winning bottle to enjoy in complete luxury. TASMANIAN RAIN - since 2006. "Captured from the purest skies on earth." The water is collected just minutes of where the World Meteorological Organization records the world's purest air. The rain, has traveled eastward via air currents over Antarctica and 10,000 miles of ocean. As a result, Tasmanian Rain contains only 17 parts per million of dissolved solids. TAU - sincde 2003. British brand of still and sparkling bottled water. TRUMP ICE - Trump Ice Natural Spring Water, often referred to as just Trump Ice, is a bottled water brand owned by American businessman Donald Trump. It was discontinued in 2010. THONON - "Eau Minérale Naturelle des Alpes." Originating in the French Alps, Thonon offers the purity and the authenticity of a great mineral water and is well balanced in minerals. Light and pleasant to drink, it is suitable for anyone, at any time of day. ULIVETO - since 1910. One of the rare natural sparkling mineral waters of the world. It emerges lightly effervescent from the spring of Vicopisano in a well-known Tuscany Thermal Park called “Parco Termale di Uliveto” . The source is known since ancient times and as far back as 1835 the water has been described as having a beneficial effect on the digestive system. VEEN - since 2006. "Smooth Finnish Spring Water." 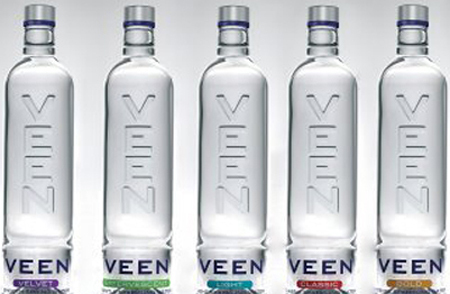 Clear VEEN Velvet is the smoothest spring water in the world. It is recommended to be enjoyed at room temperature with food, wine and good friends. In June 2009, it was announced that VEEN was chosen to be the house water of Harrods department store. VICHY CATALAN - since 1889. "YOUR HEALTH! You’ll feel better." 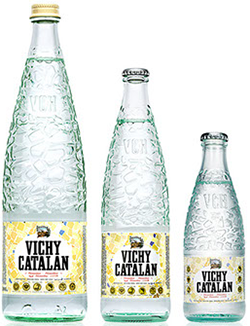 The best-known mineral water from Spain, Vichy Catalan has very high mineral content, natural carbonation, and an almost neutral pH. VICHY CÉlestins - "With a special, unique flavour and fine bubbles to delight the palate, VICHY Célestins also has a remarkable mineral composition. It provides the minerals we need in daily life. VICHY Célestins is considered as a "beauty water", the key to a radiant complexion." Vichy Mineralizing Thermal Water - "Extremely soothing and infused with antioxidants, Vichy Mineralizing Thermal Water is a natural solution for boosting skin quality and health. A unique combination of 15 rare minerals gives Vichy Mineralizing Thermal Water its remarkable ability to fortify & protect the skin from environmental aggressors." Vilas del TurbÓn - since 1931. Discontinued. VIS - since 2007. Bottled at the source and the filling process occurs in sterile rooms ensuring the necessary hygiene and eliminating the risk of contamination. 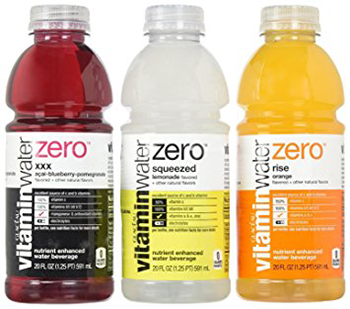 VITAMINWATER - since 2000. "Stay hydrated with electrolyte enhanced water." Stay hydrated while you enhance your water drinking experience with the vitamins and electrolytes in the many flavors of vitaminwater. Try a bottle today! VITTEL - has been bottled and made available for curative and, increasingly, for commercial purposes since 1854. Thanks to its natural abundance of calcium and other mineral salts, attained through years of filtration through underground rock layers, the pure, still water promotes strong bones for children and adults. VOSS - since 2000. "VOSS Water from Southern Norway is the purest of all major water brands. The water from this artesian aquifer is unfiltered, untreated, sodium-free and low in minerals, with a fresh, clean taste. 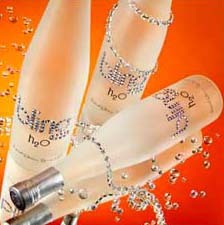 VOSS exudes purity, distinction and responsibility." Vytautas - since 1924. A very high mineral content water emerging from a spring on the outskirts of the town of Birstonas, Lithuania. WATTWILLER - Wattwiller has one of the longest pedigrees of any water. A water that is believed to have a soul, it was discovered by the Romans during their reign over the area now known as Alsace, France. It was jealously controlled by the monks of the Abbey of Murbach beginning in 735 AD. The village was called Wasserweiler – the village of water. 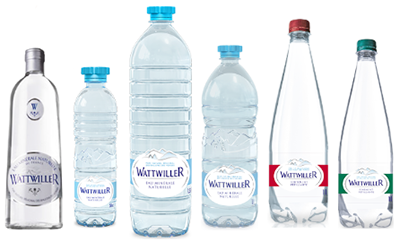 Wattwiller mineral water contains no nitrates and a very low level of sodium. It is extremely pure, hydrates you every day and care for your body day after day.